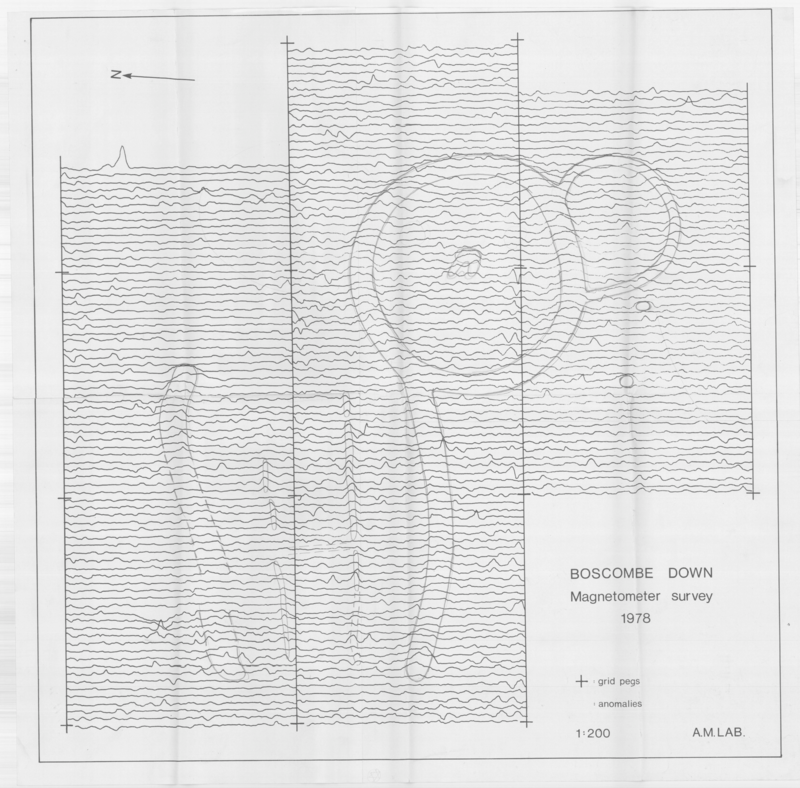 In a previous post, I described an initial survey which aimed to look for a lost long barrow near Sopley. The barrow was apparently bulldozed by American troops in WW2 to make way for Winkton airfield. 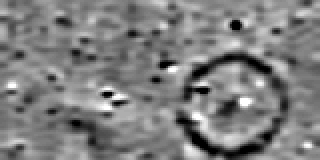 The first survey took in two 20m squares, and although inconclusive, gave a tantalising hint that there may be a large feature which potentially continued outside the survey area. 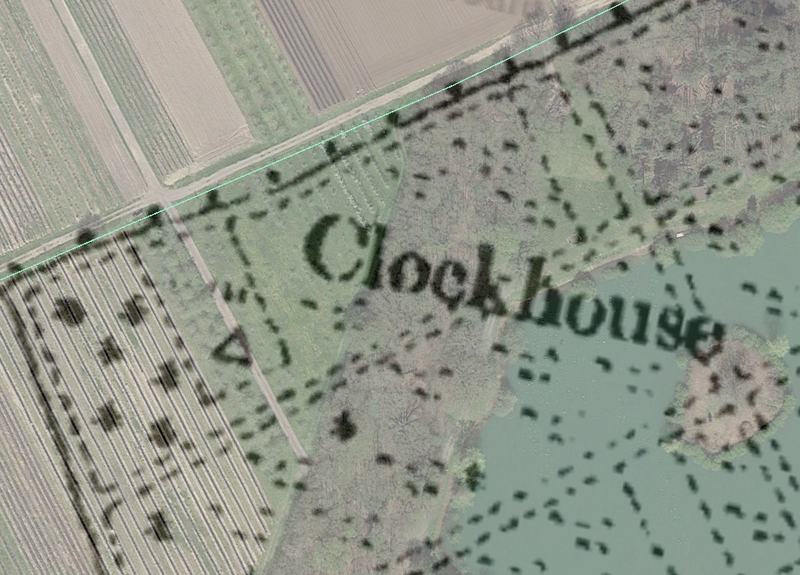 The old OS maps of the area show an interesting long thin enclosure, of similar dimensions, in a wooded area called Clockhouse Copse. This copse was truncated on two sides when Winkton airfield was built, and the area of the enclosure is in the part of the copse that was destroyed. This can be seen in the maps below. The trig point within the enclosure is also of interest, as these were usually located on raised ground. 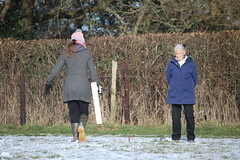 Sue Newman has also discovered that on the tithe map for the area, the field surrounding this enclosure was called ‘Burrow Close’, possibly a derivation of ‘Barrow Close’. 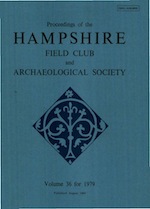 Hampshire Field Club and Archaeological Society have recently made their proceedings available online. Volumes from 1920 to 2014 are available as PDFs, with links available on the main Hampshire Studies web page. We were extremely fortunate with the weather yesterday whilst carrying out further survey work on the second possible long barrow (see Promising results from second gradiometer survey). Progress was slow due to barbed wire fences and hedges crossing the survey area, as well as very rough ground. Partial squares tested our ability to add dummy readings and dummy lines, but all worked out fine. 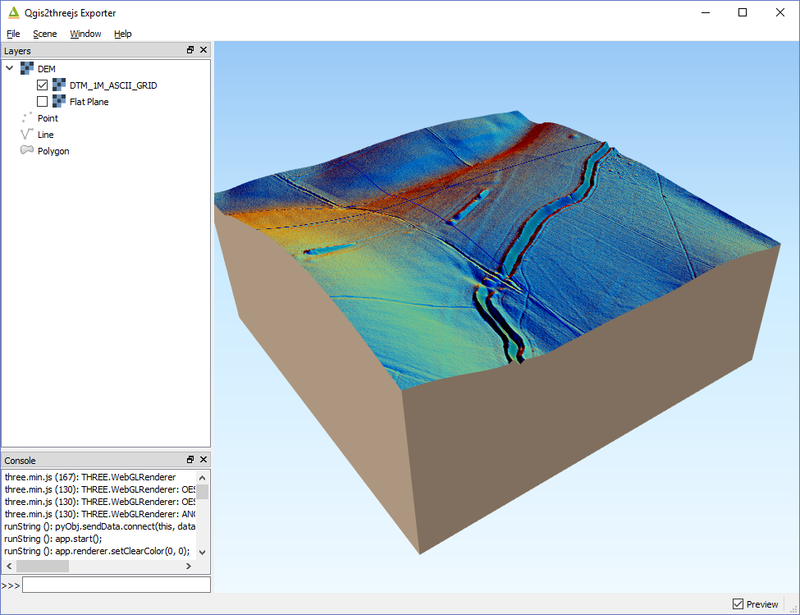 The width of the survey data is 80m. 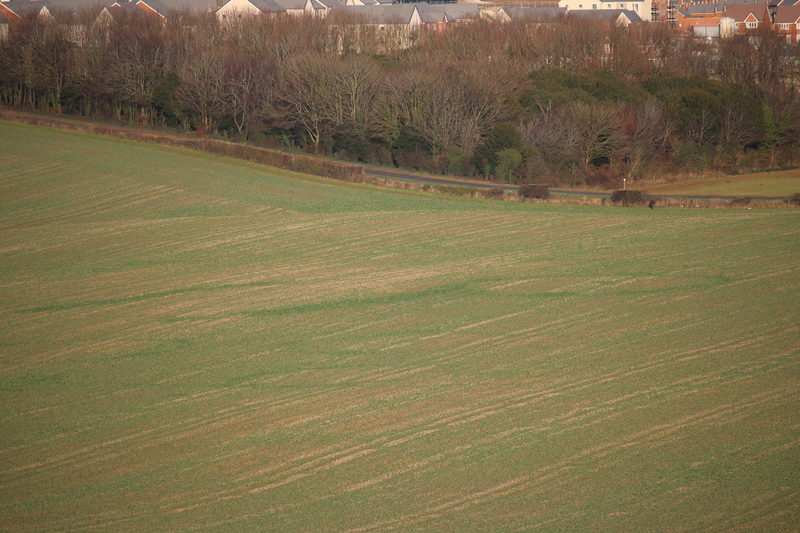 There is a wide feature that flanks the mound, and which looks like a northerly ditch. Things are less clear to the south. A barbed wire fence crosses horizontally across the centre of the plot. It isn’t that remarkable, although appears to have a gap to the west. Today I returned the gradiometer to the New Forest National Park offices in Lymington, which draws to a close our survey work for now. 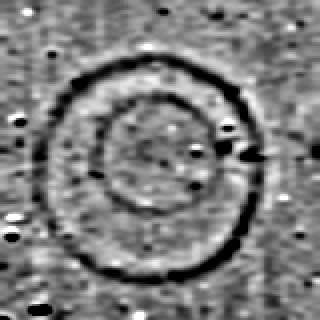 I thought it was worth including the surveys of our other sites in the fields adjacent to those above, as we are very pleased with the results. 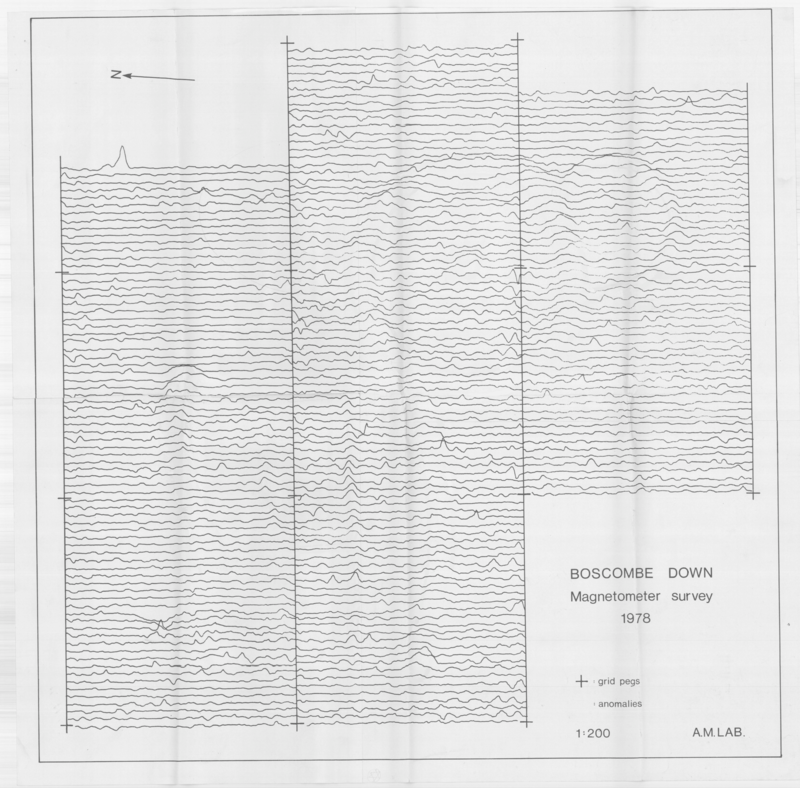 Here is the survey from the first mound, which has all the indications of a classic long barrow. The width of the plot is 80m. 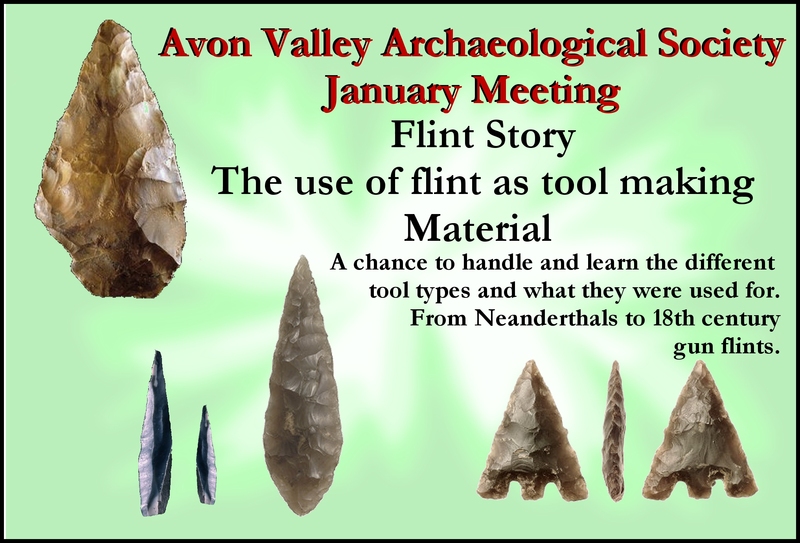 Thanks to everyone in AVAS for helping out with the surveys, to Bournemouth University for the load of the equipment, and to the New Forest National Park Authority for arranging the loan of the equipment. 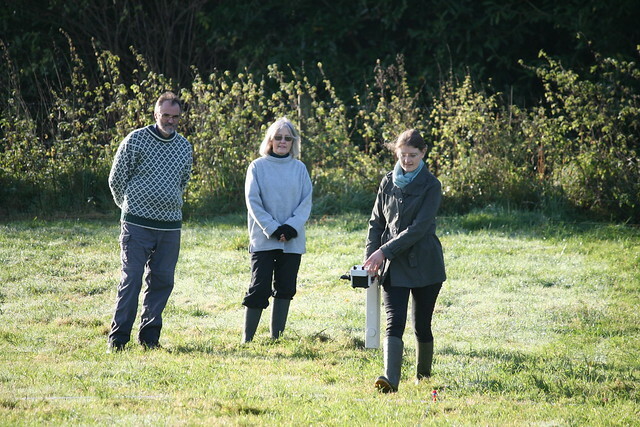 Last week we undertook our second gradiometer survey using the gradiometer loaned out by Bournemouth University as part of the LoCATE project. 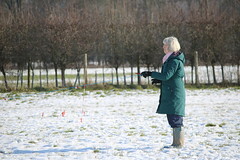 The survey site was a second ploughed out mound about 200m north of the site of our first survey. 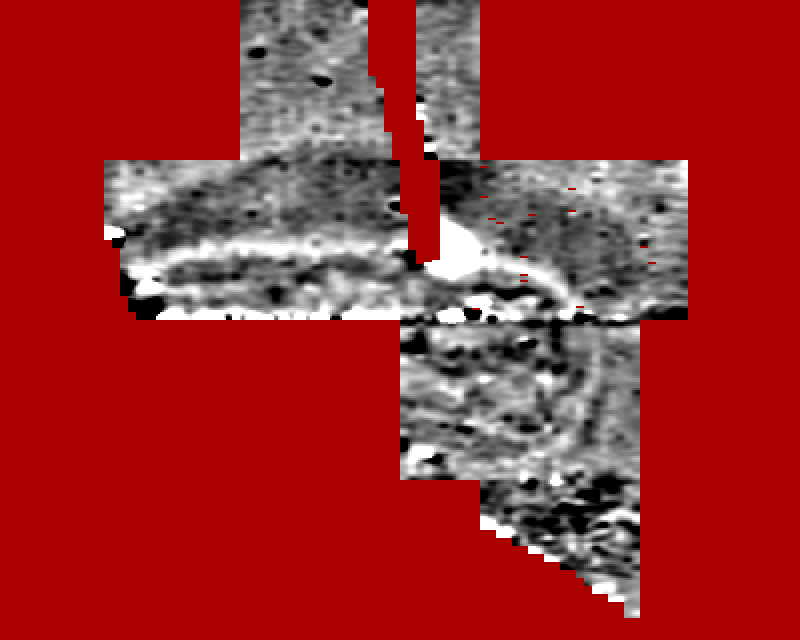 The first survey had indicated rather conclusively the site of a long barrow; a second long barrow in close proximity would be a significant and unusual find. This survey was much more difficult than our first. We had just calibrated the meter when thunder rumbled and there was a heavy downpour. 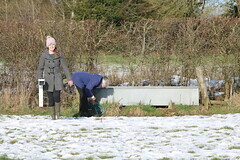 We also had to contend with a barbed wire fence cutting the site in half, as well as partial grid squares caused by field boundaries, hedges and thick vegetation. We had to work quickly given the looming black clouds. We were only able to survey the eastern part of the mound. It is possible to discern a clear, regular anomaly which curves around to the east and then travels in straight lines westwards at the top and bottom. 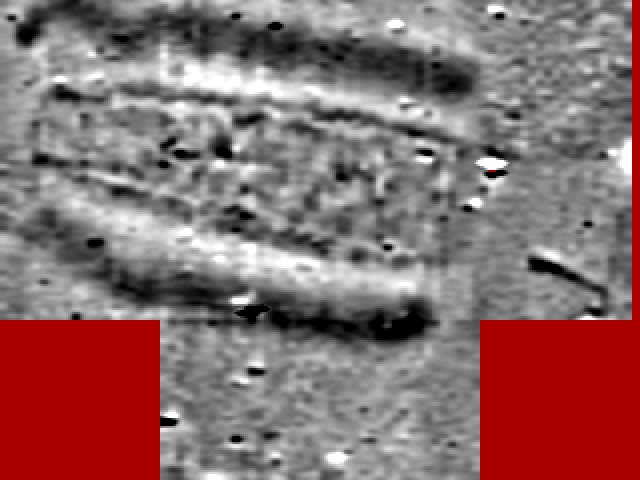 These lines appear to be starting to converge, suggesting a tapering anomaly which reflects the general shape of the mound. 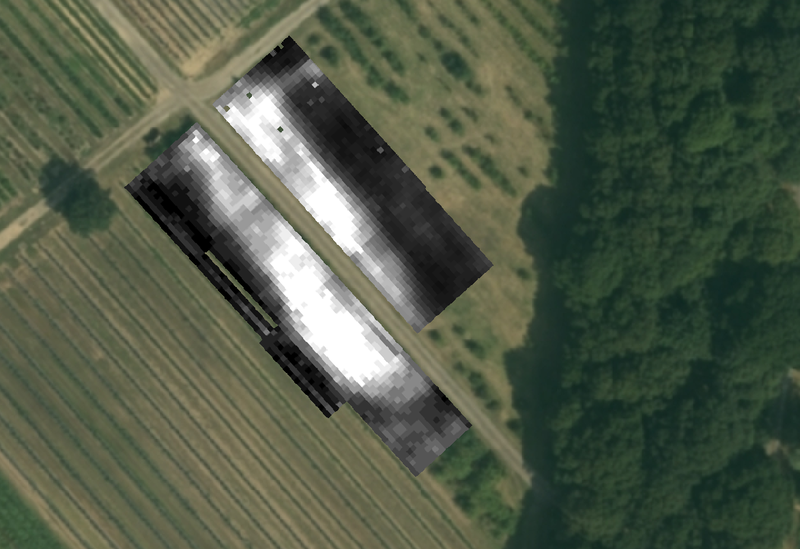 The strong black and white horizontal disturbance across the middle of the plot represents the barbed wire fence, and there is a very strong white anomaly in the top part of the plot which we are currently puzzled by. The red parts of the plot represent areas we did not survey. 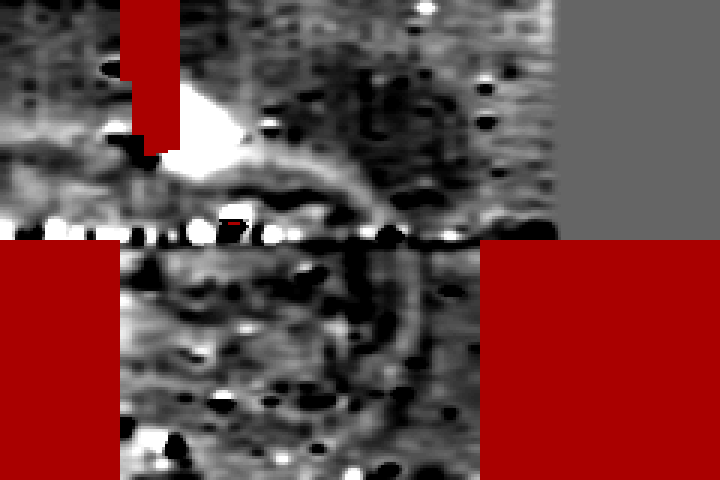 The wide dark anomaly above the curving anomaly could represent the terminal of a wide ditch; we will need to extend the survey area to the north to investigate this further. In conclusion, these results are less conclusive than those for our first survey. 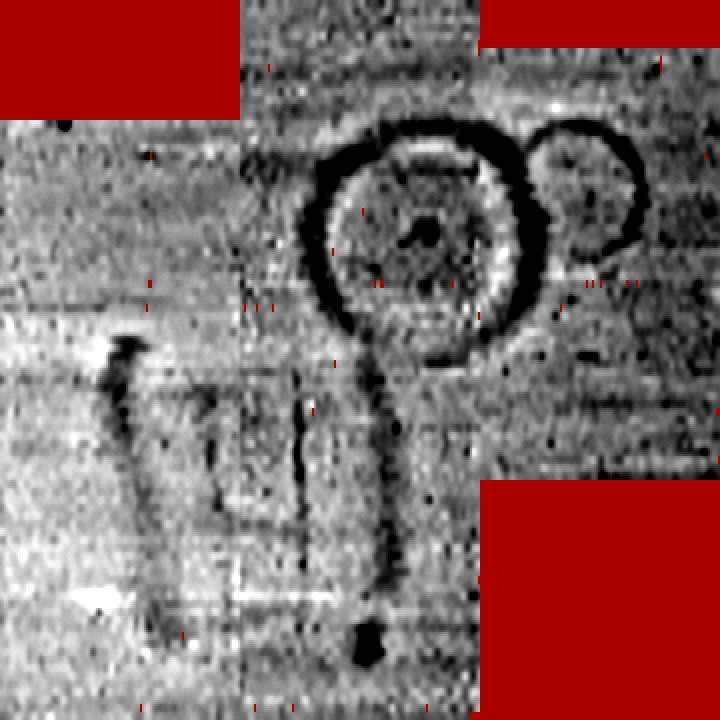 However, the regular nature of the anomalies suggest that we are dealing with a man made rather than natural mound, and the general pattern is certainly conducive to an interpretation of a second long barrow. How exciting if we can prove this! We now plan to extend the survey area where possible to investigate further this theory. We will also consult with the resident experts at Bournemouth University for their opinion on the results.